Help Desk Versus Service Desk: Which Does Your Business Need? While many lump IT support into one big bucket, there are nuances to the different models. Providing support and assistance is a core function of most IT departments. But did you know there’s actually a distinction between a help desk and a service desk? In small organizations, it’s easy to see how the lines between the two get blurred easily, but Praveen Manohar, a HeadGeek at SolarWinds, posted an article on GeekSpeak, which was named a 2014 BizTech Must-Read IT Blog, that clarifies the difference between the two. A help desk is most useful “when a service needs to be provided for customers (mostly IT users and employees, both inside and outside of an organization). This service needs a multi-threaded troubleshooting approach to maximize its benefits,” he writes. Help desks are best suited for case management, asset management and non-business-related SLAs. A service desk on the other hand, is “when technicians or business administrators need service and or coordination in the IT department. Any business that might integrate with IT for their business needs will then likely need [a] service desk in place.” Service desks are best suited incident management, problem management, change management and configuration management. Depending on the size of your organization, it might make sense to have both. 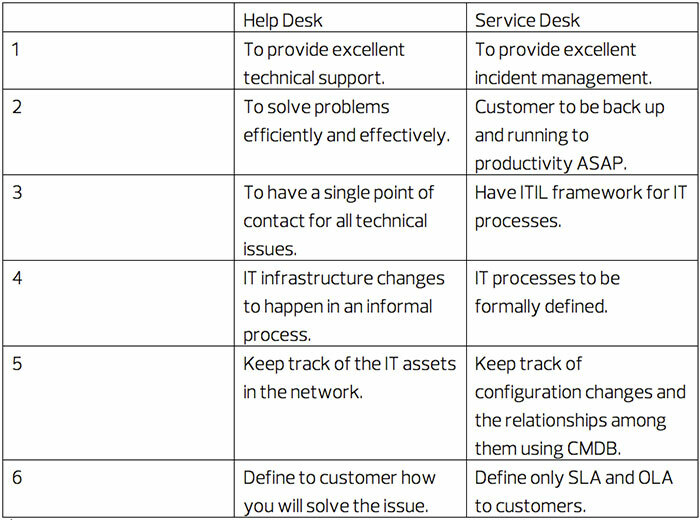 As commenters on the Geek Speak article pointed out, a help desk model makes sense for normal internal users and standard IT ticketing while a service desk model is more appropriate for servicing non-IT stakeholders within and outside of the organization. How does your IT department leverage a Help Desk or a Service Desk model for its needs?